Bikers are reliant on protective clothing and gear for their enjoyment and safety can depend on them. You should wear the best helmet and other protective gear that you can afford due to the risk of injury whenever you go ride off. You will often see bikers fully geared up with their helmets, gloves, and boots on all while sporting a pair of normal jeans. These will be great for safety and comfort, but their legs are not going get through bad falls without more than a scratch. You can do better by looking up the best motorcycle pants reviews for answers. Riders show different riding styles, and there are different kinds of biker pants to shield their lower bodies in the conditions they normally encounter on the road. Leather is more resistant to abrasion, while flexible textile materials can have waterproof coatings. Both types can come with thermal lining for use in colder conditions. After a helmet and boots, you should get a pair of pants appropriate to your riding manner in order to have more comfort and protection on the road. Overpants are often worn by bikers who hold to biker fashion tradition. Also termed Chaps, these are very flexible due to the need accommodate and protect your daily pants. Long zippers along the sides make them easier to use over boots, and thick leathers are used in order to insulate from hot engines and exhaust. Their wide-open crotch areas and bottoms allow in refreshing air for great comfort and flexibility with daily clothing underneath. While chaps can protect your legs from road abrasions, they lack armor for your bottom, which can suffer much of the road rash a bad slide can inflict. Biker Jeans are popular with casual riders and commuters for their easy fit and looks for use around town away from the bike. Although the canvass/textile blends have good abrasion resistance, some have reinforcing Aramid fibers or liners laced into the denim or stitched inside. Some brands feature armored inserts that can be quickly removed from exterior pockets. Motorcycle-ready jeans offer better protection than daily clothes but do not match the protective features of more advanced designs. Cruiser pants are the most popular type for use with cruisers or touring bikes. Casual users also like them owing to their great comfort and urban style. Many adjustments are possible at the waist so as to enable a better fit. These are often made of leather or textile combinations. Due to their relaxed fit, few if any have stretch panels. Adventure/Touring pants get their users through the different conditions that ADV riding is known for. They are designed for great flexibility and comfort for long hours on the go, through varied terrain and weather. Incidentally, textile pants are popular with tourers due to their more versatile designs. ADV pants are for bikers who are usually more intense their activities, so these are designed for more mobility and flexibility to accommodate rough use. Stretch panels are placed in key locations at the seat and knees, with pockets strategically located so as to allow freer movements. Mesh areas and vents let in more cooling air into the pants on warm days. The pants of racing suits feature a slimmed-down profile for aerodynamic efficiency and must sustain slides and collisions at the highest speeds. Thick premium leather is therefore normally used due to its long-term resistance to abrasions that is superior that of textiles. Integrated sliders or pucks allow the racer to lower his knee while cornering without incurring damage to the pants. As these are for use on tracks, real-world features like waterproofing or thermal linings are rare. For this reason, I won’t be covering these specialized suits in this review. Armor and Padding. 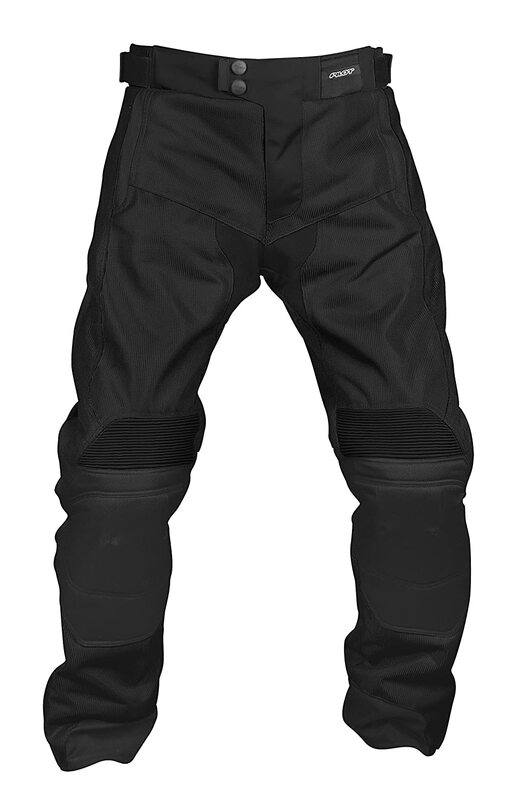 All good motorcycle pants have armor inserts around the knee and hip areas. Armor inserts or fibers can be placed or woven around the knee and hip areas, which tend to suffer the most impacts. Always look for C.E.-rated armor and denser foam pads for the best mix of protections, and padding is used on hips for more flexibility. Liners. Detachable and insulated lining gives you comfort in different conditions. Adventure bikers facing a wider variety of seasons and locales should choose pants constructed out of waterproof yet breathable textiles such as Gore-Tex. These properties ensure better drying in wet and humid conditions arising from rain and your own sweaty activity as well. Heat Protections. Adventure and Touring Bikes without fairings expose your legs to more heat coming from exposed engines and exhausts. Pants made for these situations usually feature heat-resistant panels stitched into each inseam as a result. The best such panels are built with thick, high-quality leather as a result. Dual Sport riders can use these heat protections to grip their hot bikes with the knees when they go off-roading. We’re not looking just for comfort and style, but also protections from what’s out there. With this in mind, here is a list of the best motorcycle pants reviews. 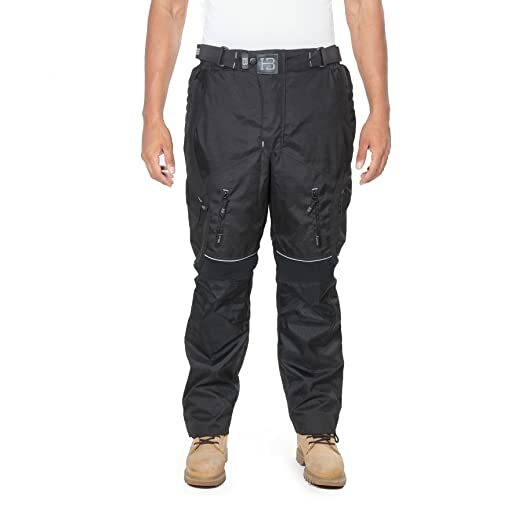 These tough overpants are made of nylon-polyester mesh with strong double/triple-stitched seams, featuring detachable C.E.-rated armor inserts and stretch panels at the knees. 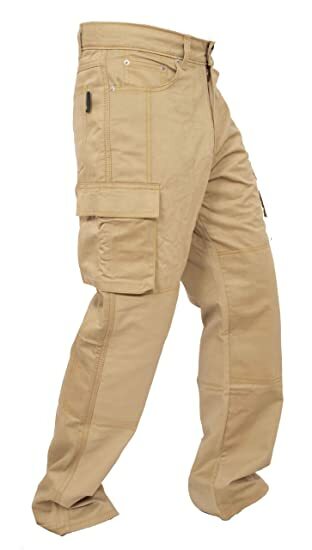 You put these overpants or chaps over your regular pants to go on wearing your regular clothes at your destination. The detachable soft waterproof/windproof lining keeps things dry and warm, with small pockets and Velcro adjusting straps on both sides. You will have to push away the long Velcro closures before unzipping and removing your boots, and there is no pass-through access to regular pants pockets. These are cut looser for more comfort in low speed commuting or touring but can flap and ride up for fast riders. Tall side zippers make it easy to get these off your shoes, and stretch overlays let you wear two sets of pants flexibly. To be sure, Omni with its durability and features is my choice in Overpants. These are perfect for casual and sports bikers who want pants that look good off and on the bike. These are also a good for budget-conscious riders as the money they save can be used for other gear. Rugged and heavy stitching on seams with strong threads are used for more durability. The denim material can keep you cool in warm weather and still warm your legs somewhat during cold days, unlike other textiles. The C.E.-rated hip and knee armor inserts are great features that are not usually included with most Kevlar-lined pants. These pants are also less pricey than others that feature the same design and construction. You may need to check if the knee padding is sewn a bit low and for ankle pads that can rub on skin, though. Altogether, Newfacelook Cargo with its good looks and great value is my choice in riding jeans. The outer shell of these touring-focused pants is made of tough Cordura and polyester with Coolmax breathable mesh liners and membrane vents. The knee and thigh protectors are C.E.-rated, with regular padding. Velcro fasteners let you adjust things at the waist and hip for a good fit. Knee and lower-back stretch panels let you move more readily for better comfort on long road journeys. You also stay warmer/cooler and drier in the varied conditions with its waterproofing and warm detachable thermal quilting. There are zippered thigh air pockets for more airflow. The pants can attach to jackets featuring the same system of rear zippers to keep both from shifting during fast rides. Tightening will ensure pants stay on during slides, and the extra padding does not shift much whether the rider is standing or seated. Overall, this is clothing that comfortable yet safer on the road than regular jeans or slacks. In short, HB Cordura Pants is my choice for touring riders facing long journeys under all conditions. 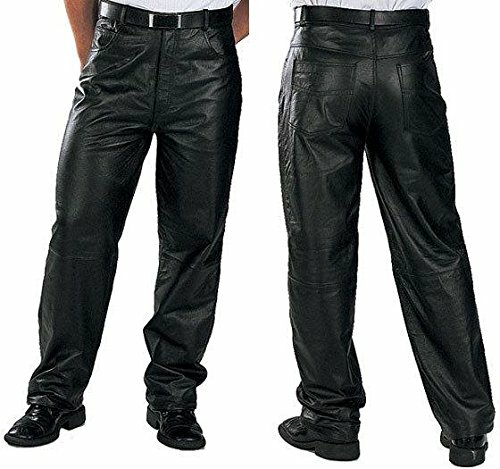 These are very comfortable, Jim Morrison-style pants that are styled in classic black leather. The fit and materials are loosely cut and cruiser-styled with soft premium cowhide and lining to the knees. A straight-cut panel at the front and five pockets allow for greater flexibility. These pants tend to be undersized so you may need to order a size larger, but they still sport slim profiles. Either way, the loose fit is comfortable with the right sizing. The flimsy pocket linings may not last as long as the tough leathers, though. Those who live in warm climes will find that the breathable lining helps to cool things, and the naturally heat-resistant leather hide makes it suitable for motocross riding as well. In a word, Xelement Classic is my choice for cruiser riders who also want to look sharp on their seats. These multi-season pants are popular among ADV bikers for their premium if pricey quality, with robust water-resistant Cordura construction and heavy nylon stitching. Leather panels on the legs shrug off engine heat and protect from abrasion during scrapes and slides. Armor and stretch zones along the bottom, knees, upper hip, and groin areas provide for great protection with flexibility. Long zippered vents let in air to cool your thighs and the cargo pockets are great, although more padding on the side would be nice. Adjustable cuffs with Velcro fasteners and knee and boot guards let the user cinch down to fit a variety of boots and gloves. The loose cut is very comfortable but the legs can flap at high speed as a result. These pants are not fully waterproofed but do keep out most rain and dry quickly on the run. 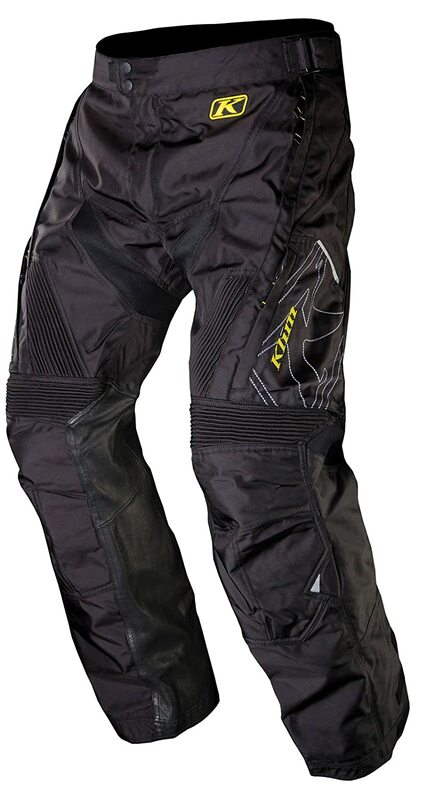 On the whole, Klim Dakars are the best all-around pants and my choice for ADV and MX/Enduro bikers. Whether you are riding pavement or crossing hills and trails, you will need good biker pants in addition to helmets and gloves to avoid injuries and enjoy more comfort. It’s great that many types with different features are available to suit the needs of bikers with various riding styles and conditions. From my list of the best motorcycle pants reviews, my overall pick for a pair of non-winter pants is Klim’s Dakar. It’s a bit expensive, for sure. But its good flexibility and construction suits my varied riding style, while still providing great protection for when things go tumbling south. However, not everyone has the same needs or budget. In sum, you should first figure out what you’ll be encountering during and after your rides, then decide on clothes you can wear with confidence. If you have comments to leave, please add them in the following section. Feel free to share this review with others you may know who are considering a new motorcycle pants.